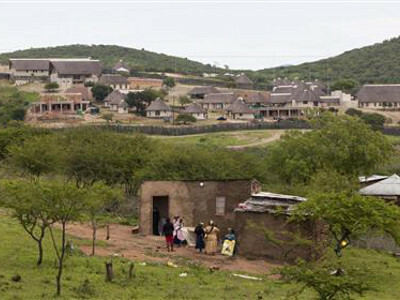 This week’s visit to Nkandla as part of Parliamentary oversight by an ad-hoc committee brought to light that the South African National Defence Force (SANDF) clinic built close to the presidential lodge is not operational yet because of the wider Nkandla investigation. The clinic building, apparently not yet fitted with any medical or other equipment, was described as “a primary healthcare facility” the SANDF “needs to start operating and running soon” according to Brigadier General Siphiwe Shezi as reported by News24. He also said the clinic was necessary to help soldiers and police in the area when they get sick. This comment drew acerbic response from the SA National Defence Union (Sandu) whose national secretary, Pikkie Greeff, welcomed the new Nkandla sickbay. “SANDU calls on all its members and their families, who reside in the vicinity of Nkandla, to make ample use of this new top grade facility with immediate effect. “Soldiers and their families are encouraged to report to Nkandla for health-related issues instead of travelling all the way to Durban or Ladysmith. “SANDU is concerned about press reports that the sickbay is not functional. However, seeing it is a military medical facility, we encourage members to report to the sickbay at Nkandla, nevertheless. “Should there be any refusal/failure to treat soldiers and/or their dependents, as provided for in the Defence Act 42 of 2002, SANDU will take the necessary legal action to compel the SA Military Health Service (SAMHS) to provide medical services at the Nkandla sickbay,” the man who has proved to be a thorn in the side of many senior military officers as well as the SANDF’s legal services division said. Shezi was speaking to media during Wednesday’s visit to the presidential estate and surrounds. He told them there was a need for a medical facility in the Nkandla area of KwaZulu-Natal because it would help soldiers and police working there. “We have high blood pressure from our work, you know we are a sick nation so that’s why we needed a facility nearby,” he is reported as having said. “Here in KwaZulu-Natal we have the joint tactical headquarters in Durban. From 2000 until 2005 SAMHS tried to procure a hospital in Durban … before it was decommissioned because we wanted to build a fourth military hospital. He explained Natal Command was previously responsible for the province but its headquarters on the Durban beachfront was decommissioned in 2009 after a consolidation process. Shezi is reported by News24 as saying when the president chose to settle in Nkandla, it was convenient to build a military clinic there. “There is this belief we need to do things for the community, but we must build infrastructure so the community can also benefit. He said it was a 24 hour facility adding in an emergency a helicopter could be called. Shezi said the clinic was not part of Nkandla and funds for it were sourced “differently” and asked media to ask the Department of Public Works about its cost. “This is not a security feature, this is a clinic,” he said.